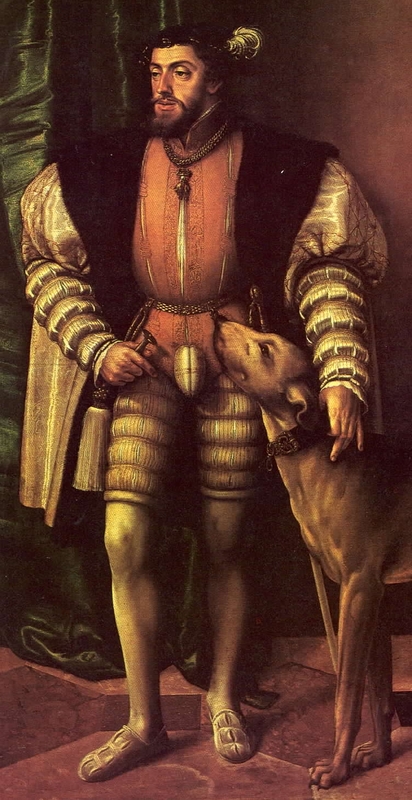 Charles V’s reign sparked some of history’s greatest cataclysms: Magellan’s circumnavigation of the globe, Cortés’ annihilation of the Aztec Empire and Pizarro’s (distant cousin of Cortés) destruction of the Inca civilization. Charles also knew a thing or two about the Inquisition. 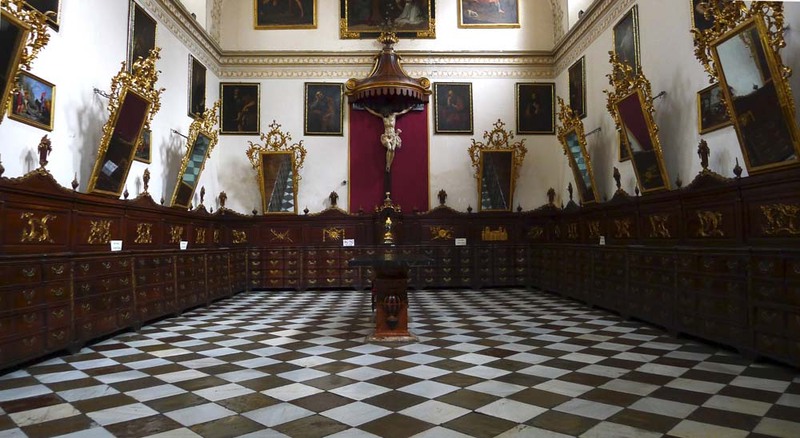 Emperor Charles was a project manager for many magnificent Counter-Reformation buildings such as the Cathedral of Granada – a psychological assault by the limitless wealth of Catholic Kings. 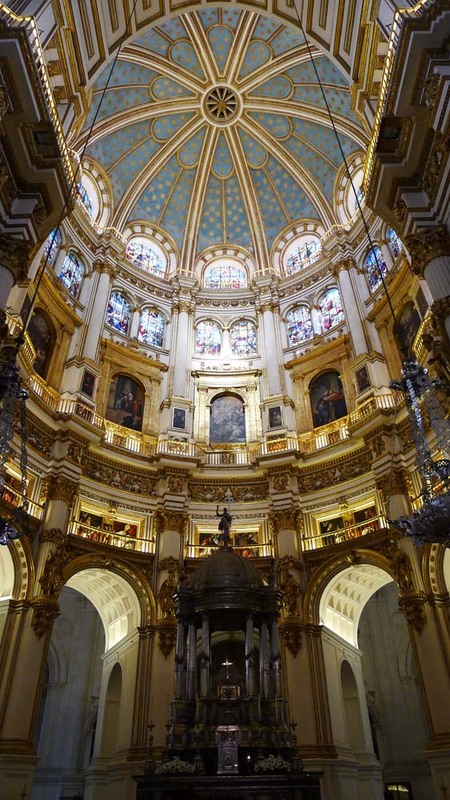 Granada Cathedral. This spectacular edifice vanquished more than 8 architects and required 181 years of construction. 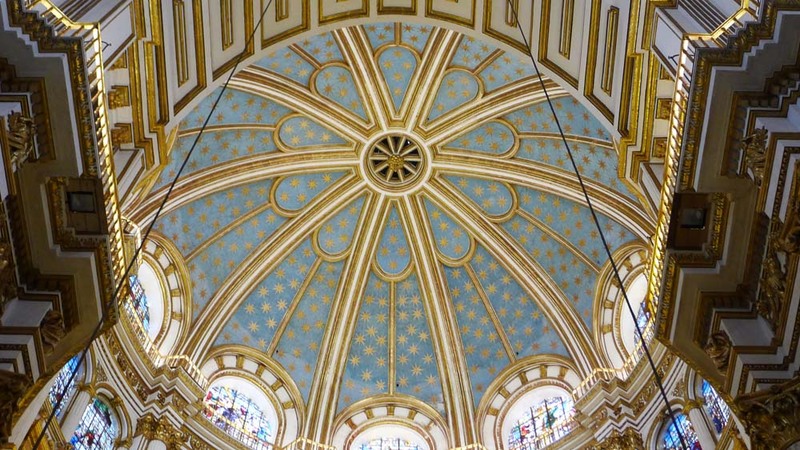 The circular chapel – feels like we’re standing inside a globe. 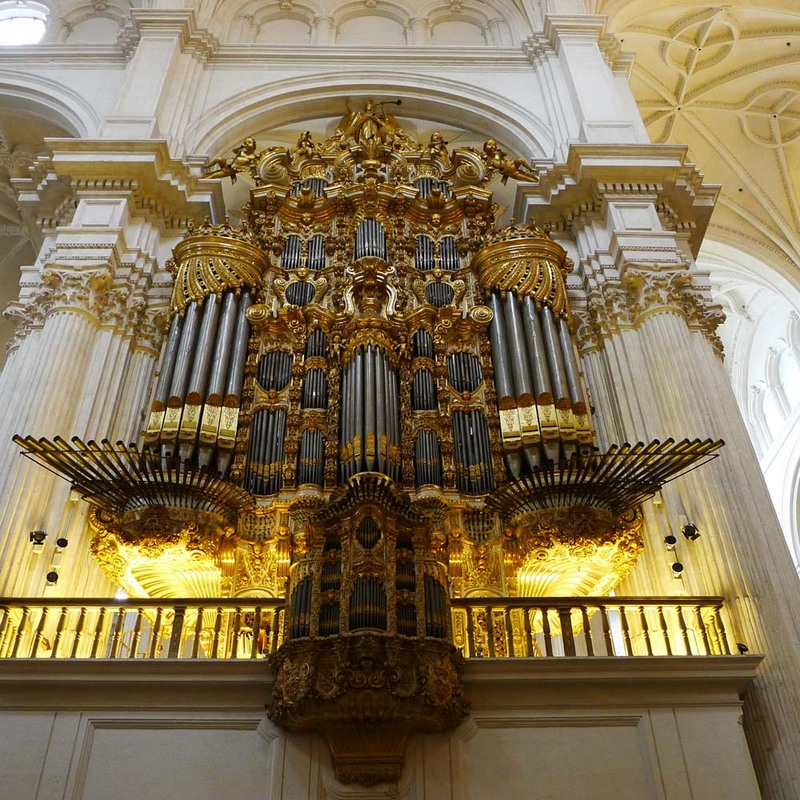 One of the pair of monumental organs. 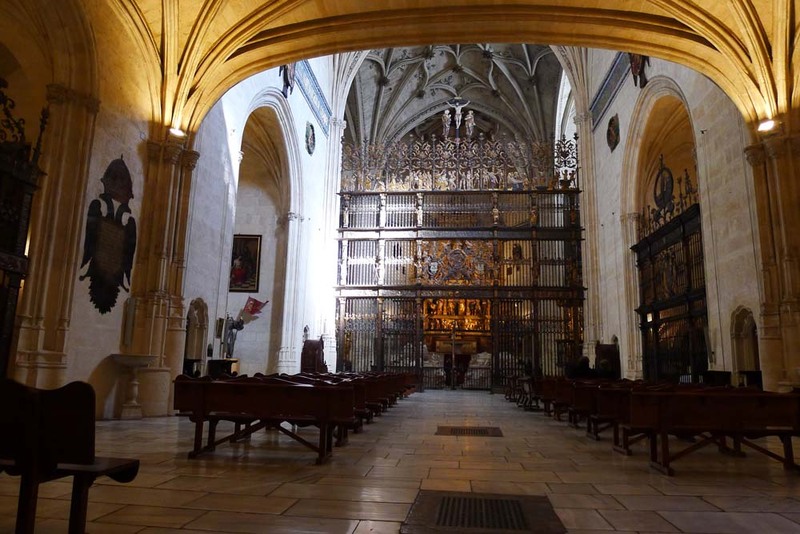 Towards the end of his life, Charles moved into a monastery to nurse his gout, his epilepsy and painful TMJ from his Habsburg jaw. Positively exhausted by his own reign, he abdicated to his brother and his son. 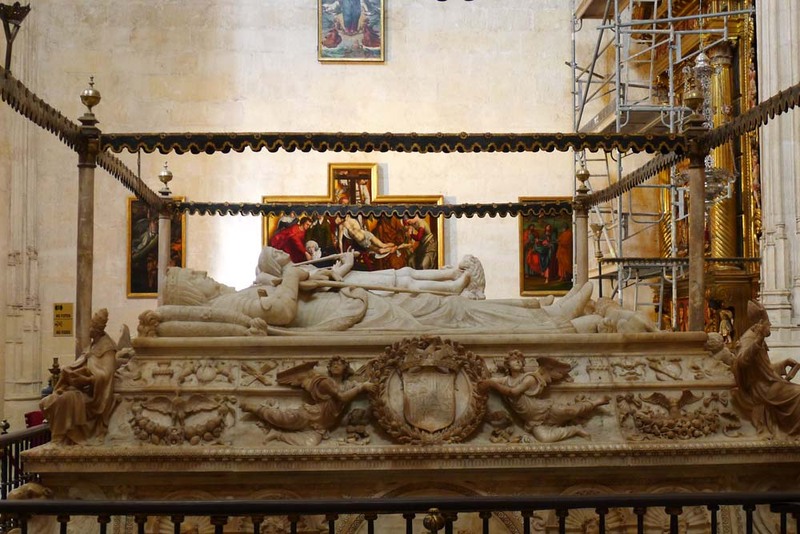 Then he succumbed to malaria long before the cathedral could be finished. Caveat: photos are strictly prohibited inside the CHAPEL ROYAL so the next three photos were the result of a secret mission to capture the likenesses of Ferdinand, Isabella, their daughter Joanna the Mad, and her husband Philip the Handsome, even if they had clearly stipulated in their wills 500 years ago that they never, ever wanted to turn up in a 21st century travel blog. Entrance to the Chapel Royal. The Royal effigies are having a bit of facelift. 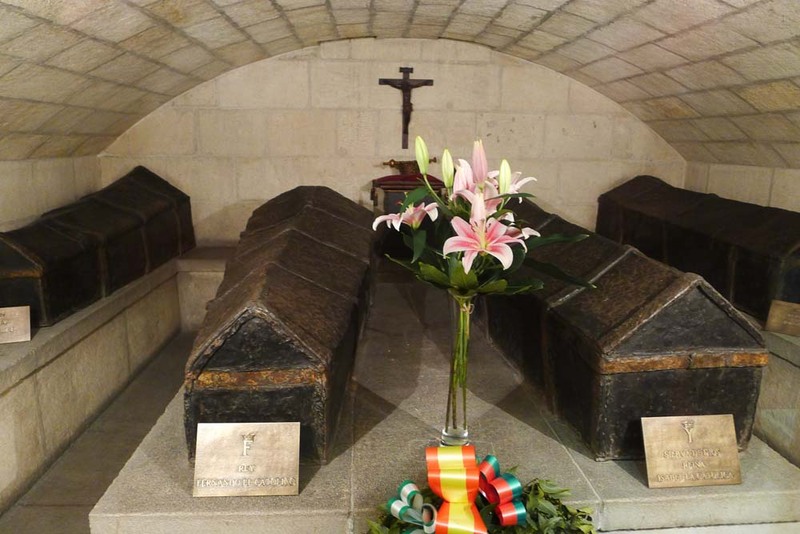 They keep the bodies down here in the crypt. I usually recommend TIME OUT guides for hotel and restaurant advice, and THE BLUE GUIDE series for enriching information. Too bad I can’t recommend the THE BLUE GUIDE, SPAIN, because the author, Ian Robertson, doesn’t like Spain and drones on about the burden of travel writing, “… particularly in Spain, where obtaining any reliable information can be a pointless and time-wasting occupation.” Whew! Ian, you’ve got to stop eating so many bitter oranges. 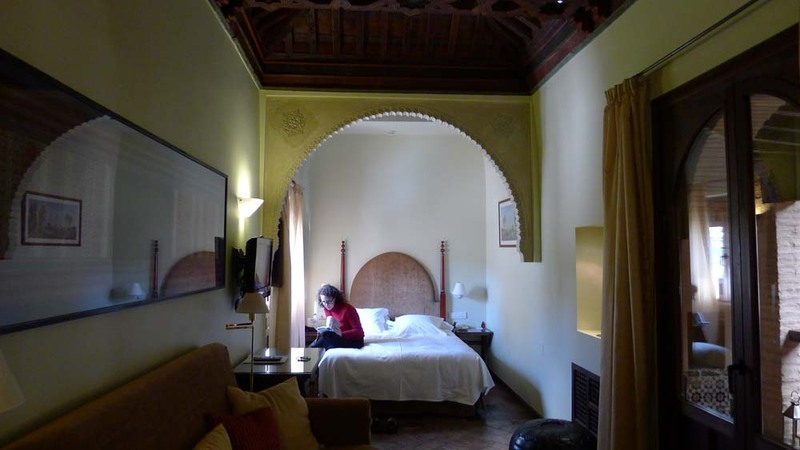 The 16th century ceiling of our room at Hotel Morisco. 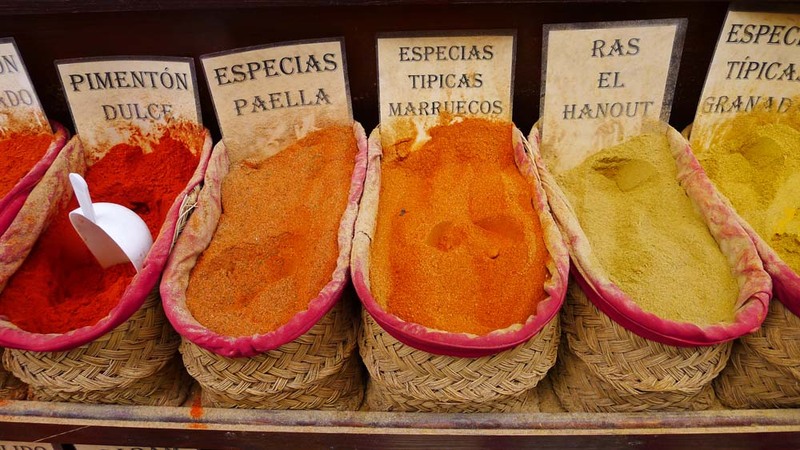 Spice venders, with roots in North Africa, provide the indispensable tastes of Granada. We found the cuisine of Granada much less youthful and innovative than that of Sevilla. 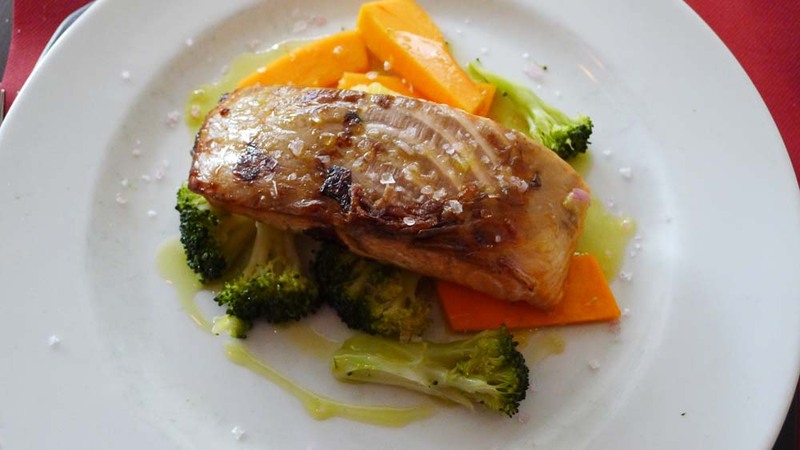 However, we recommend restaurant RUTA DEL AZAFRAN, Paseo de los Tristes, 18010 Granada, Spain 958 226 882. 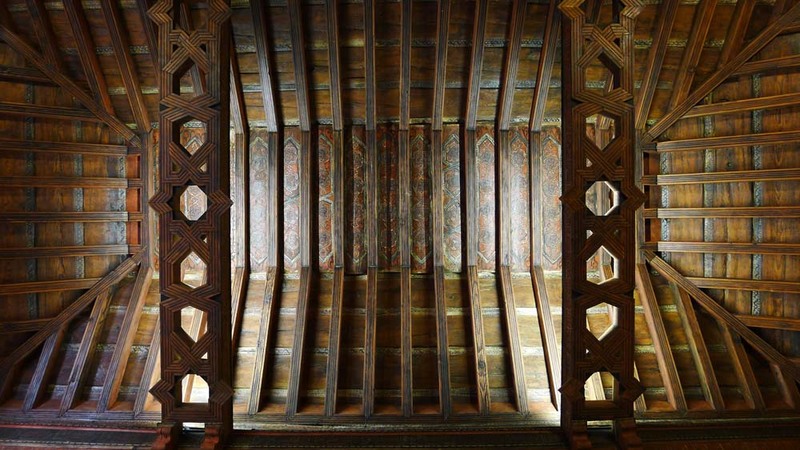 The restaurant is situated in the valley beneath The Alhambra so if you reserve a window table you’ll be looking straight up into a medieval world. 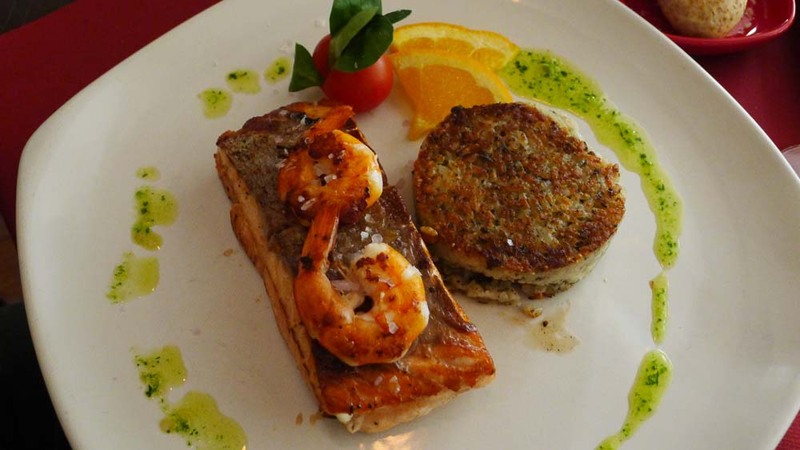 Salmon with shrimp and risotto cake. 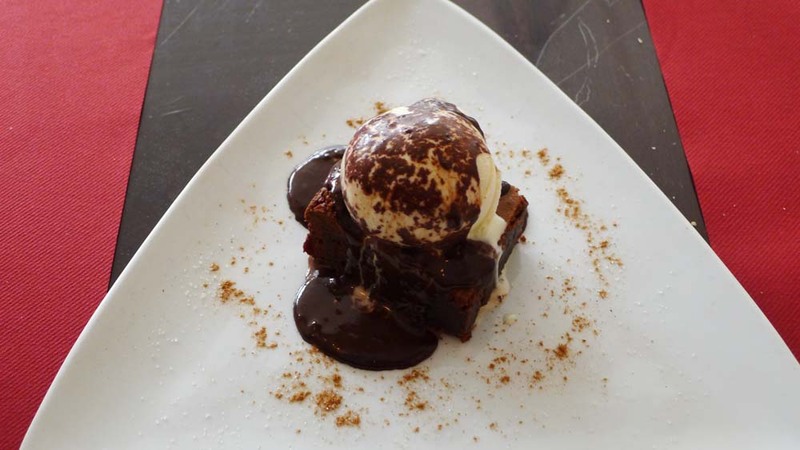 This brownie hot fudge sundae is part of Spain’s crucial multi-cultural heritage. Mucho gusto!